Week 3 is in the books, with some late game thrills, debuts, and a lot of hard earned road wins through the weekend’s inclement weather. Let’s look at some of this week’s stories. Saturday featured the first game for the new-look Empire. New York added a lot of big names to a team that already had a few. Marques Brownlee did not make his Empire debut as he was accepting an award, but should play against Ottawa. Beau Kittredge did suit up for the first time, slotting into the offense. New York showed flashes of greatness, but still clearly needs some time to work on chemistry. The team has a ton of talent but is still in the process of trying to acclimate everyone to the team system. Toronto trailed early in the matchup as New York held a two-point lead for much of the first half. The Rush scored on a massive grab from Jeff Lindquist to end the half and bring the score to 8-7. Harper Garvey and the New York offense came out of half firing. The Empire stretched the lead out to three early, scoring the first two points out of half. Toronto followed with a run of its own, scoring four straight, including and incredible diving grab from Iain McKenzie after he boxed out Jeff Babbitt. It was around this point when the lack of game experience as a team started to show for the Empire. Time ran out on the team’s final possession of the third quarter, missing on a chance to tie the game at 12. The Rush took advantage and began to build a lead. Up 15-12, Bretton Tan earned a layout block just outside the endzone to set up an easy Toronto score and solidify the lead. The two teams traded points to close the game, with the Rush winning 18-14. Toronto extended its winning streak to 15 straight over New York. The Empire looked like one of the best teams in the league through most of the game, at one point being up 10-7 on last year’s runner up, before the Rush went on an 11-4 run to end the game. If this team can figure out how to gel and win games, they can be in contention for a title. Jeff Babbitt, Ben Jagt, and Beau Kittredge could be the best cutting trio in the AUDL, however, Babbitt and Jagt were mostly playing defense in an interesting strategic decision. Kittredge is going to need time to build cohesion with his new teammates. He played the most points of anybody on the Empire and didn’t look comfortable. Strategically, the idea of Babbitt, Jagt, and Kittredge playing more offense together is tempting, and would force teams to be perfect on defense to beat them. New York has a ton of top end talent and if they can get on the same page, they have a lot of potential. For the first time in AUDL history, a west coast team traveled to Texas for a regular season game. The Los Angeles Aviators looked utterly dominant in their opener last week against the San Diego Growlers, but were playing this trip without Jesse Cohen, who was out with a wrist injury, and Mark Elbogen, who stayed in LA to rest his knee after an ACL injury sidelined him much of last season. In the Game of the Week Saturday night on Stadium, The Austin Sol started the game with a break on the first point and established an early 5-1 lead. Austin looked much more comfortable than LA throwing in wind, evidenced by a number of miscues in the opening minutes from the Aviators’ stars. Chris Mazur followed up his stellar LA debut last week with another key performance, jumping in occasionally as a steadying presence on the O-line to add another thrower capable of pushing the disc through the wind. The steady wind was a struggle for both teams, especially for Austin after do-it-all handler Matt Bennett got hurt late in the first half, taking away a powerful and creative arm. Chase Cunningham, Michael Natenberg, and Jeff Loskorn stepped up for the Sol and picked up the slack. LA settled down and was able to bring the game within one after an early second quarter break, but still suffered from uncharacteristic mistakes, leaving many missed opportunities on the field. In addition to struggling to throw in the wind, LA was playing this game after traversing half the country. The combination of rigorous travel and adverse playing conditions threatened to derail Los Angeles’ promising start to the season. With such large distance between many of the west coast teams, the ability to play well after a long day of travel in incredibly important. Just like last week, some lesser known players stepped up and played star-level games. Aaron Weaver had 3 layout blocks to catalyze the Aviators’ D-line. His defense kept Los Angeles in the game despite their initial struggles. Offensive cutter Brent George made the highlight of the night (and perhaps the season) with a #SCTop10 grab. Despite their heroics, Austin maintained a two point lead, 13-11, at the break thanks to a buzzer beating hammer caught by Michael Matthis after a late LA throwaway in their own half. The wind settled down a bit in the second half, allowing for smoother offensive output. After knocking on the door throughout the game, LA finally tied it at 16-16 after a 4+ minute point on a Mazur deep shot to Sean McDougall, but went into the 4th down by 1 after another end-of-quarter miscue. Tim Beatty waited for a centering pass to come his way just a millisecond too long, while Austin’s Jerrod Wolfe snuck in for the layout grab and immediately got up to throw for the goal. In the 4th quarter, Eli Friedman initially missed the catch on a huck to tie the game but was able to corral his own tip with a minute left. Austin received the pull and worked the disc around until Jeff Loskorn launched a speculative shot towards the end zone with three seconds left. Two Aviators defenders sat back, and were blindsided by Sol receiver Kyle Henke flying in front of them to steal the disc and the game. This game has to feel like a missed opportunity for LA. Losing on a buzzer beater always hurts, but the Aviators miscues led to buzzer beaters in the 2nd, 3rd, and 4th quarters. There were other indications of sloppy play too, including a pair of downwind hucks that bounced out of the hands of Aviators receivers. All in all, this is a game LA probably wishes it could have back, especially when facing a 1-2 start with a Sunday afternoon game at Dallas. The second game of the back-to-back featured much of the same from LA. While they started stronger, they still were down early after a 1st quarter 4-0 run from Dallas. Dallas used that edge to maintain a 3-4 point lead throughout the entire game, winning 20-17. LA again struggled to maintain consistent throws in the wind. They also had trouble coping with a tall Dallas double team, leading to dangerous (and often unsuccessful) overhead passes. Los Angeles now sits half a game back of everyone else in the West Division. While the two game out-of-division skid isn’t the end of their season, LA would have liked to see a win in one of these two games to assert its place atop the West. They welcome first place San Jose next week, looking to get back to their winning ways. The San Diego Growlers managed to come away from their game in Seattle with a win. 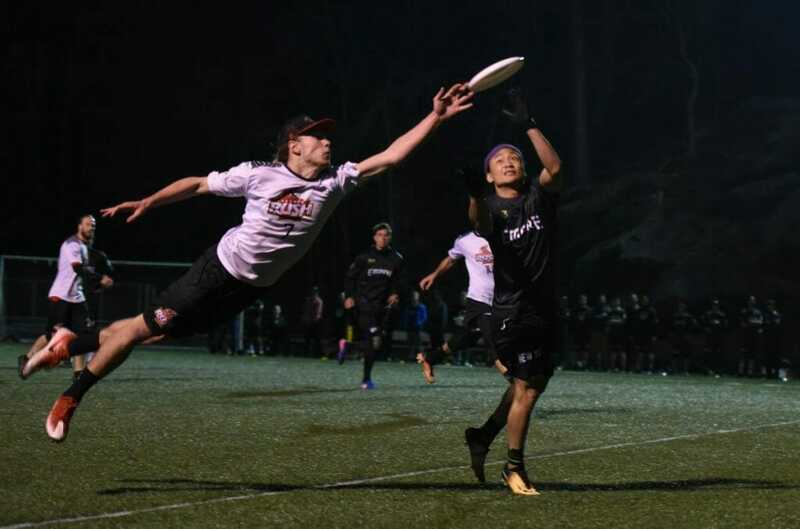 It was a rainy night in the Emerald City and slippery discs mean highlight plays. Cam Bailey was able to pick up a first half Callahan and Mark Burton caught a tipped huck, leading Seattle to a 11-9 halftime lead. The Growlers then went on a 3-0 run to take back control of the game and a 16-15 lead after 3 quarters. It was a tight game throughout, but the Growlers pulled away, blanking the Cascades in the 4th quarter to pull out a 21-15 win. Many expected the Growlers to finish last in the West this season, and they looked nearly lifeless in last week’s loss to LA. This win might change their expectations; if they can remain this competitive against the stronger teams in the West (remember, Seattle was coming off of an impressive win against Minnesota), San Diego might be able to threaten for a playoff spot. This game was historic in another important way: it was the first AUDL game to feature multiple women. The Cascades are among a handful of AUDL teams who rostered women this season. Most teams have historically rostered exclusively men. This year Seattle, features Oxhna Titcomb, Steph Lim, and Charlie Eide as rookies, with all three making their debuts last night. Titcomb and Lim played primarily on offense, though with some defensive points as well, and Eide played with the D-line. Lim and Titcomb each recorded an assist, and at least one woman was on the field for Seattle for most points, accompanied by some interesting defensive wrinkles with deep help and switches. After an offseason which featured a lot of community discussion about gender equity, it is encouraging to see at least one team create a structure for women have a meaningful impact in the AUDL. We’ll keep an eye out for other teams who are able to do the same, and what impact these rookies have for Seattle. 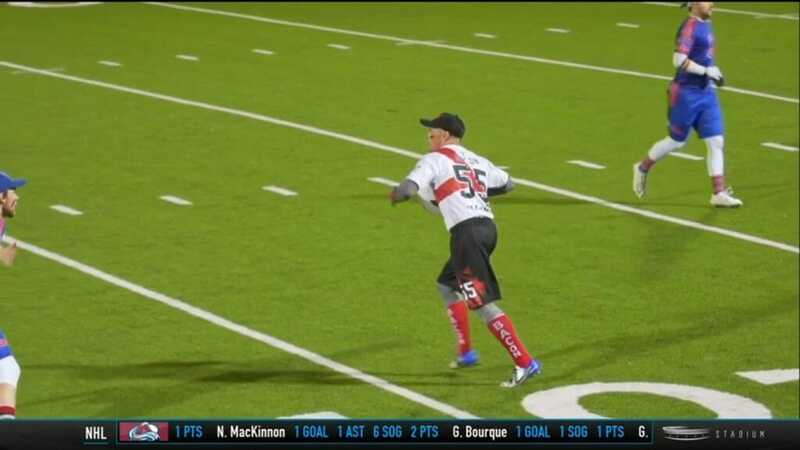 Los Angeles Aviators player Tyler Bacon wore “Bacon” socks during his team’s game Saturday night against the Austin Sol. It doesn’t jump out quite as much as Tampa Bay Cannons Coach Andrew Roca’s outfits, or Seattle’s Alex Duffel’s Joker make-up, but they fit the team color scheme nicely. After a trip down I-95, the Rush looked to build some early separation in the division with a showdown against the Phoenix. The conditions in Philadelphia were certainly a bit tough to play in with wind gusts nearing 30 mph. Despite the wind, there was a decent amount of scoring in the game, particularly in the first quarter. Toronto got off to a hot start. Back-to-back breaks gave them an early 6-3 lead. Jay Boychuk hauled in two goals, half of his total for the day, in those first six points. Philly closed it back down to two before the end of the quarter. The Rush tallied three in a row to open the second quarter, showing some signs of breaking the game open up 11-6. The Phoenix refused to go away though. Matt Esser made a few spectacular grabs to pull Philadelphia back to a two goal deficit at halftime. Whatever momentum Philly took into half they brought it back to the early stages of the second. After a quick hold, Scott Xu came up with a hand block that set up the goal, tying the game at 12. Toronto then hit an offensive spurt, scoring three straight, including Drew Wilson’s first career goal. The fourth quarter became the Sean Mott and Ethan Peck show for Philly. The two scored or assisted on every goal of the final period for the Phoenix. Philly made it interesting with two goals in the final minute, but the comeback attempt was cut short. The Rush held on 19-18. Early signs indicate this is going to be a competitive division top to bottom. Montreal upset D.C. at home opening weekend and Philadelphia came within one of Toronto. Ottawa gets its first game of the season in Week 4 against New York. The Royal square off with the Phoenix and Toronto travels to California for a rematch of last year’s championship with San Francisco. Quite possibly, Andrew Roca dressing as famous coaches is having a positive effect on the Tampa Bay Cannons. While they are 0-3 so far this season, they are consistently exceeding expectations. They were tied with Raleigh at the end of the first quarter and were leading 11-10 by half. The Flyers ended up with the victory, but not after a good fight by a team considered to be at the back of the pack. Women’s professional games have officially started, with the Nashville playing their second game against the Atlanta Soul, who had their team debut this weekend. The game was streamed online by Fulcrum Media, and while the quality suffered for the first 35 minutes because of poor weather, it eventually improved. The game was full of a plethora of turnovers, often attributed to the weather or miscommunications. Despite a game under their belt, Nashville struggled to match Atlanta, falling 23-8. The teams are certainly still figuring out their chemistry and adjusting to longer field and different rules, but I am looking forward to the Indy Red versus Detroit Riveters this weekend! A little social media savvy combined with some basic photoshop skills got the Wind Chill featured on SB Nation’s Twitter despite not actually having done anything on the field. This is something that most of the ultimate world can learn from. Not only should teams be doing the basics like tweeting scores, but I’d love to see something like this from the Cascades for every game. A simple social media post giving everyone all the necessary information to attend, find, or follow the game. Minnesota’s game against Madison didn’t fare as well as their tweet, as it was postponed. The Chicago Wildfire beat the Pittsburgh Thunderbirds 20-15 in an unstreamed game. Chicago did not keep stats but Sam Van Dusen had 4 assists and played the most points for Pittsburgh. The Indianapolis Alleycats beat the Detroit Mechanix 24-12. Indianapolis spread the disc around and played a smart game while Detroit couldn’t get anything going on offense. Detroit’s offensive line only scored 42% of the time compared to Indianapolis’ 79%. Indianapolis had 47 turnovers while Detroit had 57. Comments on "AUDL Throwaround: Toronto Spoils Empire Debut, LA Falls to Last, Accessory Watch"